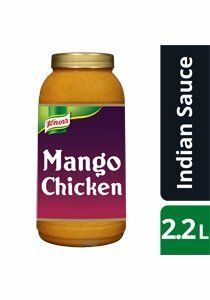 A mildly spiced, sweet mango simmer sauce. Due to the authentic nature of this product, some oil separation may occur. Stir well before use. Simply heat and serve. Once opened, keep refrigerated and use within 3 days, or freeze remaining contents immediately. Defrost in the fridge and use within 24 hours.